This sweet little visitor entertained me throughout the spring & summer last year. I watched her build her tiny nest up in the tree on my property. I sat with binoculars as she tended to her babies, taught them how to fly and eventually departed on her mysterious trip from Sparta, NJ to...Texas? Maybe even across the Gulf to Mexico! 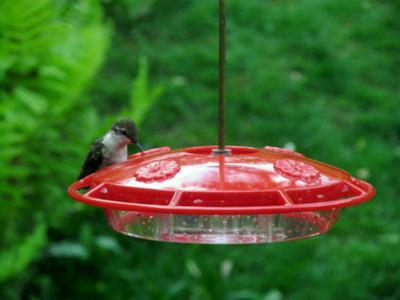 Over the winter I bought her this saucer-style feeder so she could rest her wings as she sipped her nectar. I hoped she would return safely this year. 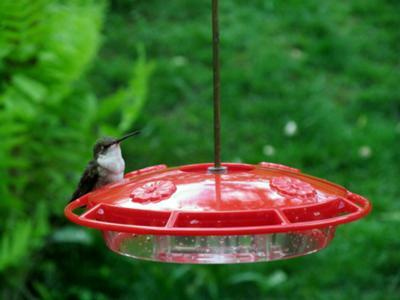 I rejoiced when I spotted this pretty female Hummingbird in my yard in early May! Could she be the same Hummer from last year? Regardless, I just love watching her and I think she appreciates her new feeder.